With more than 16 sites, STAR provides supported accommodation solutions to Tasmanians with disabilities and their families, in addition to respite services and other daytime and overnight support for people and their loved ones who are in need of immediate support. However, like many not-for-profit organisations, STAR Tasmania is always looking for additional funding and better ways to manage its resources. By acquiring the Hitachi VeinID systems, this important service provider has managed to reduce costs associated with managing human resources. View short video clips throughout this case study about STAR Tasmania and their partnership with Hitachi Australia and Showing how Hitachi Finger Vein Scanners have enabled significant cost savings and improved security and services for this disability services provider. (2min, 05s). 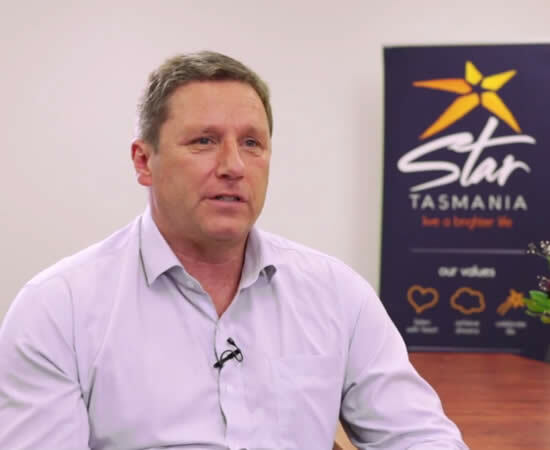 With tight-margins and a manual, inefficient and laborious rostering system, STAR Tasmania was losing time they could have spent supporting their clients. STAR Tasmania implemented Hitachi Vein Scanners to provide more accurate and reliable method of user authentication and security. STAR Tasmania has saved over $100,000 per year with the use of Hitachi Vein Scanners through time savings and error reduction. Continue the technology “revolution” within the organisation that will ultimately improve the lives of the people that STAR supports. STAR Tasmania is a specialised, community based organisation providing Accommodation, in home, Community Access, Case Management and Respite Services for people with disabilities. STAR Tasmania was established in July 2009 following the amalgamation of established community accommodation support agencies, Supported Housing Inc and Star Tasmania Inc. STAR took over the operation of another not for profit residential organisation, Tranquillity Base Inc, in December the same year. Major management systems cost savings. Improved services for hundreds of people with disabilities and their families. Better staff morale and improved computer literacy.